chipKIT is Microchip's official answer to the popular Arduino module. Its based on the PIC32 so its very powerful. I still prefer 8-bit especially for beginners so I prefer to use the CHIPINO module, but the chipKIT needed some documentation so I wrote the first book on chipKIT targeted at the beginner. The book has sold well but many people have commented that it doesn't show all the features of the chipKIT. And that is because it was written for the beginner just getting started not the Arduino user who wants to go further. I guess that is a book for a future date. 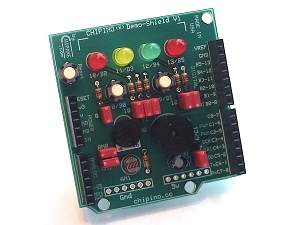 In the book I use the CHIPINO demo-shield so a beginner can do all the experiments without having to solder or hook up any external circuits. The chipKIT was designed by Digilent Inc. and they did a great job on it. The software was ported over from Arduino by a couple of guys from Rutgers university. The chipKIT has a steering team made up of many experienced engineers and I'm also part of that team though I tend to focus on the beginner side of things not the advanced stuff. Check out the chipKIT forum and details page at chipkit.net.